Canares #1 Selling Coax! A lightweight, VERY flexible RG59/U equivalent that is perfect for all video facility equipment interfacing, ENG/OB work and video patch cords assemblies. Smooth non-glarefinish PVC jackets are available in all 10 Canare Colors, including Chroma-Key Blue. Tightly woven, >:94% Bare Copper Braid Shield. 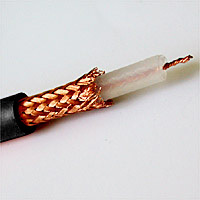 Conductor: 24 AWG Stranded Copper for flexibility. Conductor DC Resistance: <:25.9 ohms/1000 ft.
Shield DC Resistance: <:4.0 ohms/1000 ft. Available Jacket colors: Black, Blue, Brown, Gray, Green, Orange, Purple, Red, White, Yellow. FOR CUTS: 50 Minimum for single channel cable.